HAPPY MOTHER'S DAY! 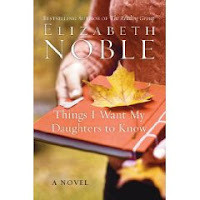 I absolutely loved that Harper Collins is allowing me to giveaway five copies of THINGS I WANT MY DAUGHTERS TO KNOW by Elizabeth Noble. If you haven't had a chance to look at the comments on my initial giveaway post, I highly recommend it! I asked for "a little piece of advice that is appropriate for a daughter -- it doesn't matter if you have one or not." I got some incredible answers that are definitely worth reading. I loved all of your answers and wished I had copies of this book for all of you! I am so excited to have won this - thank you so much!!! Yay! I look foward to reading my copy.